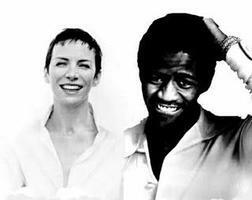 From 1988’s hit movie Scrooged, Annie Lennox and Al Green joined forces for a cover of Put A Little Love In Your Heart. The result was a sound that was almost unbeatable. The man who crooned his way to stardom on soulful hits like Lets Stay Together and the woman who powered the Eurhythmics into the stratosphere may have seemed like an unlikely combination, but it worked beautifully. A top ten hit, Annie and Al had a blast in the video for the song. Combining scenes from the movie, interspersed with them performing the song for the cameras, it was a recipe that really made history. One of the best duet performances of all time, this pair sparkled in their only collaboration together. It still makes you feel good to hear this song. You want to dance, you smile like mad, and you just want to share it. You really do feel the desire to put a little love in your heart. Pardon the pun.